The Royal Air Force has donated a Sea King (Sikorsky S61 built in UK under licence) to the Falkland Islands Museum and National Trust. The aircraft is serialled XZ593. The RAF has maintained SAR cover in the Falkland Islands since the conflict there in 1982. From 1st April 2016, and in line with the Sea King fleet-wide retirement, a new regime began after the UK Ministry of Defence put the SAR role out to tender. This was won by AAR, who subcontracted the operation of two new AW189s to British International Helicopters for a period of ten years. This company already operated a pair of aging Sikorsky S61s (yes, the type the RAF retired!) on cargo and transport work around the Islands in the south Atlantic, and these have been included into a new contract via AAR. The donation of a Sea King to the museum is, in reality, a cost-saving exercise as there is no justification to spend money returning the aircraft to the UK when it will just be parked up and scrapped. 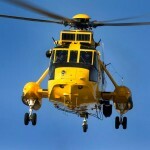 The future of the second Sea King – registered ZE370 – is currently unknown.